UPDATE: Nov. 23, 2008 – These presets are now also available on the Adobe Lightroom Exchange. Hello again, I’m back in the Lounge to take a little breather. I’ve been busy of late working with my favourite program – Lightroom. I was pleased when Lightroom 2.1 came out and solved a number of problems that had been bothering some customers. As I mentioned in my last video, my first impressions of Lightroom 2.1 was good and I am so glad I no longer have to wait while all the folders load when Lightroom first starts. I’ve been working daily with Lightroom 2.1 and so far it has only crashed on me once – and I can’t seem to repeat the error! Anyhow, I’m here to ask for your help. I’ve been giving a lot of thought to how one could simulate masking in Lightroom. I am sure that eventually Adobe will bring out version 3 and we’ll at least be able to import masks from Photoshop (which would open a range of new possibilities in Lightroom). In the mean time, I’ve come up with an idea how to simulate masking. Have a look at the photo on the left, click on it if you like to get a larger view. It’s the result of a new preset that I’ve come up with. I might add, this all came about during the development of a concept I had based on the “Golden Rule of Thirds” principle in photography. This is one of the fundamental compositional techniques in art and photography. Curiously enough, the masking sample shown here was not a planned thing – it just ended up as a result while developing my concept. After I developed the core presets to give my concept form, I started making some sample Lightroom presets to show off the concept. They are finished. Now, I’m looking for feedback from people who are willing to take the core concept and give it a try in Lightroom 2. I’m making a full set of presets available on my WEB site for anyone to download and try out. I would like those who do try it to give me their feedback so I can better refine the next version. To wet your appetite, here’s a few sample presets I built using the core presets (a more complete list can be found in the article on the main site). In this sample, I wanted to show how the flexibilty of the preset builder. 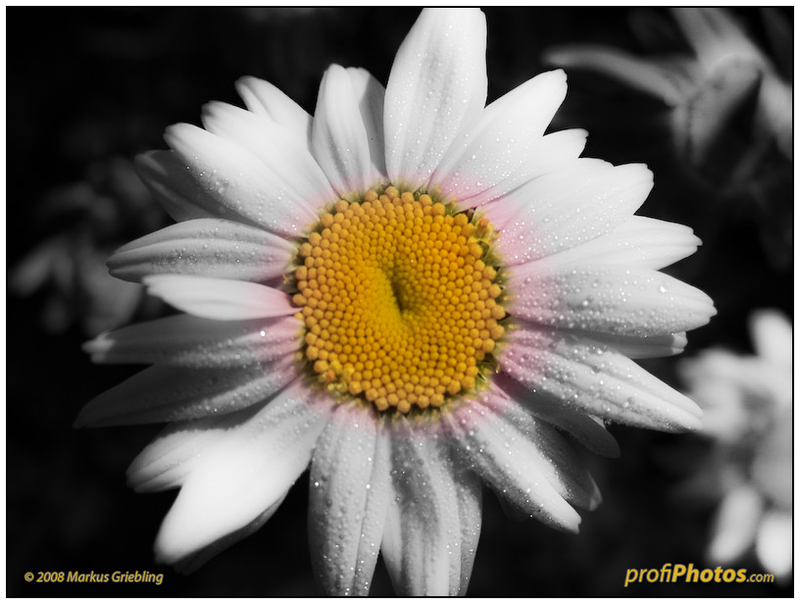 Here you see the blending of colors in different areas of the photo combined with B&W and sharpness effects. Another wild example of this technique can be seen in the Alien effect further down. An example using the Soft Focus preset. You’ll also notice I took advantage of the fact that I already had a couple of adjustment filters in place and darkened up a couple of trouble spots. The net result gives the photo much more appeal. I had a lot of fun coming up with this preset. I took the base preset (Focus – Center) and played with the sliders. I tweaked and fine-tuned and flipped gradients to come up with this preset. I’ve tested it on lots of photos and in 75% of those tested, came up with some pretty wild results. 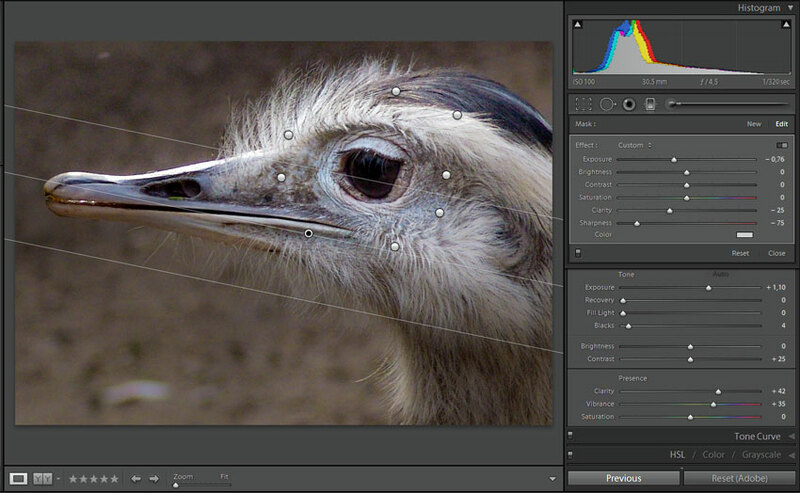 To show the preset in action, have a look at the next photo. It shows how I’ve built a mask around the eye of the bird in the photo. Now I know I could have done this with the adjustment brush, but the results take a lot longer and the resultant mask is not easily transferable from one photo to the next. So having said all that, I’m hoping I’ve peaked someone’s interest enough to give it a go. Here’s the link, the complete concept is described in detail on the WEB site. If you download the presets collection from the main site, please return to the main site once you’ve played with the presets and leave your comments there. Read about and download the Focus Beauty Builder presets collection. Thanks a bunch and as Adobe suggests in Lightroom Rule #5 : Enjoy! This entry was posted on November 8, 2008 at 9:43 pm	and is filed under Graduated Filter, Just Ramblin, Lightroom 2. Tagged: Adobe, Develop Presets, Download, Feedback, Lightroom 2, Masking, New Concept, Presets, Soft Focus, Test Drive. You can follow any responses to this entry through the RSS 2.0 feed. You can leave a response, or trackback from your own site.